Take a closer look at the mural by hovering over the photo. 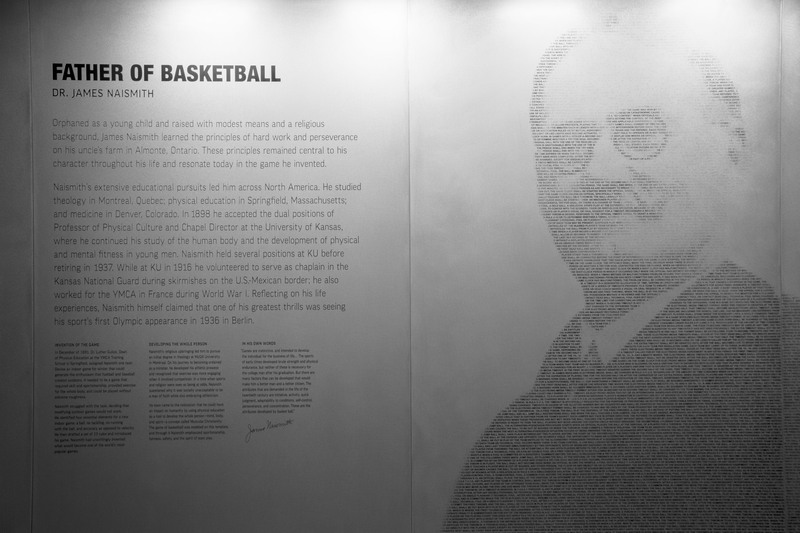 A portrait of Dr. Naismith greets visitors to the north side of the Rules Gallery. The portrait, standing more than 9 ft tall, is created solely from lines of text that make up the contemporary rules of basketball. Why not the Original Rules? There are no more than 500 words in the original document, while today’s rule book holds over 50,000. Beside the portrait are paragraphs describing Naismith’s early years, his focus on faith, his pursuits in the health profession, his military experiences and other unique elements of his life.